The parable of the marriage feast. 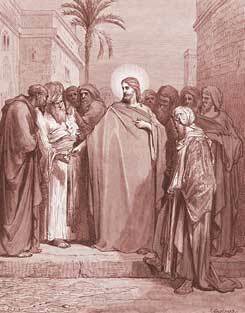 (1-14) The Pharisees question Jesus as to the tribute. (15-22) The question of the Sadducees as to the resurrection. (23-33) The substance of the commandments. (34-40) Jesus questions the Pharisees. (41-46)1-14 The provision made for perishing souls in the gospel, is represented by a royal feast made by a king, with eastern liberality, on the marriage of his son. Our merciful God has not only provided food, but a royal feast, for the perishing souls of his rebellious creatures. There is enough and to spare, of every thing that can add to our present comfort and everlasting happiness, in the salvation of his Son Jesus Christ. The guests first invited were the Jews. When the prophets of the Old Testament prevailed not, nor John the Baptist, nor Christ himself, who told them the kingdom of God was at hand, the apostles and ministers of the gospel were sent, after Christ's resurrection, to tell them it was come, and to persuade them to accept the offer. The reason why sinners come not to Christ and salvation by him, is, not because they cannot, but because they will not. Making light of Christ, and of the great salvation wrought out by him, is the damning sin of the world. They were careless. Multitudes perish for ever through mere carelessness, who show no direct aversion, but are careless as to their souls. Also the business and profit of worldly employments hinder many in closing with the Saviour. Both farmers and merchants must be diligent; but whatever we have of the world in our hands, our care must be to keep it out of our hearts, lest it come between us and Christ. The utter ruin coming upon the Jewish church and nation, is here represented. Persecution of Christ's faithful ministers fills up the measure of guilt of any people. The offer of Christ and salvation to the Gentiles was not expected; it was such a surprise as it would be to wayfaring men, to be invited to a royal wedding-feast. The design of the gospel is to gather souls to Christ; all the children of God scattered abroad, #Joh 10:16; 11:52|. The case of hypocrites is represented by the guest that had not on a wedding-garment. It concerns all to prepare for the scrutiny; and those, and those only, who put on the Lord Jesus, who have a Christian temper of mind, who live by faith in Christ, and to whom he is all in all, have the wedding-garment. The imputed righteousness of Christ, and the sanctification of the Spirit, are both alike necessary. No man has the wedding-garment by nature, or can form it for himself. The day is coming, when hypocrites will be called to account for all their presumptuous intruding into gospel ordinances, and usurpation of gospel privileges. Take him away. Those that walk unworthy of Christianity, forfeit all the happiness they presumptuously claimed. Our Saviour here passes out of the parable into that which it teaches. Hypocrites go by the light of the gospel itself down to utter darkness. Many are called to the wedding-feast, that is, to salvation, but few have the wedding-garment, the righteousness of Christ, the sanctification of the Spirit. Then let us examine ourselves whether we are in the faith, and seek to be approved by the King. 15-22 The Pharisees sent their disciples with the Herodians, a party among the Jews, who were for full subjection to the Roman emperor. Though opposed to each other, they joined against Christ. What they said of Christ was right; whether they knew it or not, blessed be God we know it. Jesus Christ was a faithful Teacher, and a bold reprover. Christ saw their wickedness. Whatever mask the hypocrite puts on, our Lord Jesus sees through it. Christ did not interpose as a judge in matters of this nature, for his kingdom is not of this world, but he enjoins peaceable subjection to the powers that be. His adversaries were reproved, and his disciples were taught that the Christian religion is no enemy to civil government. Christ is, and will be, the wonder, not only of his friends, but of his enemies. They admire his wisdom, but will not be guided by it; his power, but will not submit to it. 23-33 The doctrines of Christ displeased the infidel Sadducees, as well as the Pharisees and Herodians. He carried the great truths of the resurrection and a future state, further than they had yet been reveled. There is no arguing from the state of things in this world, as to what will take place hereafter. Let truth be set in a clear light, and it appears in full strength. Having thus silenced them, our Lord proceeded to show the truth of the doctrine of the resurrection from the books of Moses. God declared to Moses that he was the God of the patriarchs, who had died long before; this shows that they were then in a state of being, capable of enjoying his favour, and proves that the doctrine of the resurrection is clearly taught in the Old Testament as well as in the New. But this doctrine was kept for a more full revelation, after the resurrection of Christ, who was the first-fruits of them that slept. All errors arise from not knowing the Scriptures and the power of God. In this world death takes away one after another, and so ends all earthly hopes, joys, sorrows, and connexions. How wretched are those who look for nothing better beyond the grave! 34-40 An interpreter of the law asked our Lord a question, to try, not so much his knowledge, as his judgment. The love of God is the first and great commandment, and the sum of all the commands of the first table. Our love of God must be sincere, not in word and tongue only. All our love is too little to bestow upon him, therefore all the powers of the soul must be engaged for him, and carried out toward him. To love our neighbour as ourselves, is the second great commandment. There is a self-love which is corrupt, and the root of the greatest sins, and it must be put off and mortified; but there is a self-love which is the rule of the greatest duty: we must have a due concern for the welfare of our own souls and bodies. And we must love our neighbour as truly and sincerely as we love ourselves; in many cases we must deny ourselves for the good of others. By these two commandments let our hearts be formed as by a mould. 41-46 When Christ baffled his enemies, he asked what thoughts they had of the promised Messiah? How he could be the Son of David and yet his Lord? He quotes #Ps 110:1|. If the Christ was to be a mere man, who would not exist till many ages after David's death, how could his forefather call him Lord? The Pharisees could not answer it. Nor can any solve the difficulty except he allows the Messiah to be the Son of God, and David's Lord equally with the Father. He took upon him human nature, and so became God manifested in the flesh; in this sense he is the Son of man and the Son of David. It behoves us above all things seriously to inquire, "What think we of Christ?" Is he altogether glorious in our eyes, and precious to our hearts? May Christ be our joy, our confidence, our all. May we daily be made more like to him, and more devoted to his service. I was attacked with words by person who hates me and I didn't know how to answer them. I remember Jesus being asked by what authority he did these things. Jesus answered them with a question that they could not answer. He knew how to answer his enemies. Matthew 24: 40 And no man was able to answer him a word, neither durst any man from that day forth ask him any more questions. Matt 22:37 reminds me that there is purpose in His words. As we keep our focus on Him, all other things fall into place. If we are not serving Him, we can only be serving satan. We must love Him with ALL we have, every breath praise or glorify Him , every move be filled with His spirit , and holding every thought captive....someone remember that last scripture and how it goes..."holding every thought captive according to..." Be well. What Do You Think of Matthew 22? How should we love the Lord our God?